I think spring will forevermore say Shakespeare to me. 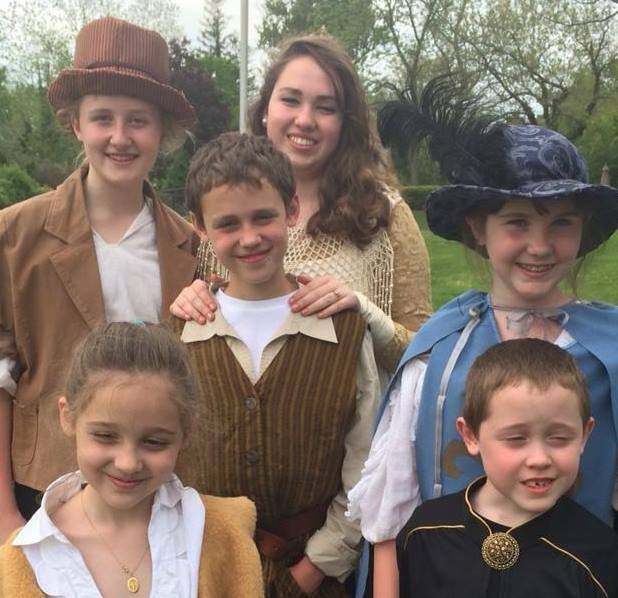 This is the eleventh year that the kids have participated in the homeschool Shakespeare group called Front Lawn Players and as always it brings it’s own chaotic joy to our lives. 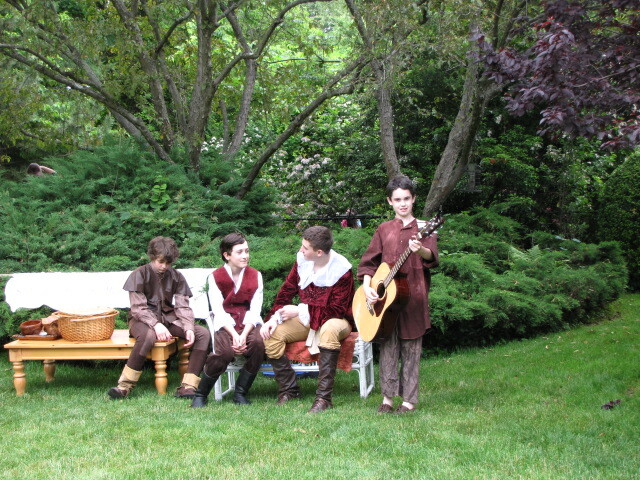 In the beginning, after much research, our intrepid director decided that small children could, in fact, memorize and perform Shakespeare as it was written. No condensed or adapted versions for us. We’ve never regretted the extra work and the children rose to expectations beautifully. That first year A Midsummer Night’s Dream was chosen and it really is an ideal play for young children. I think our oldest at that time was sixteen, Oberon was his part, and then the ages went right down to three. 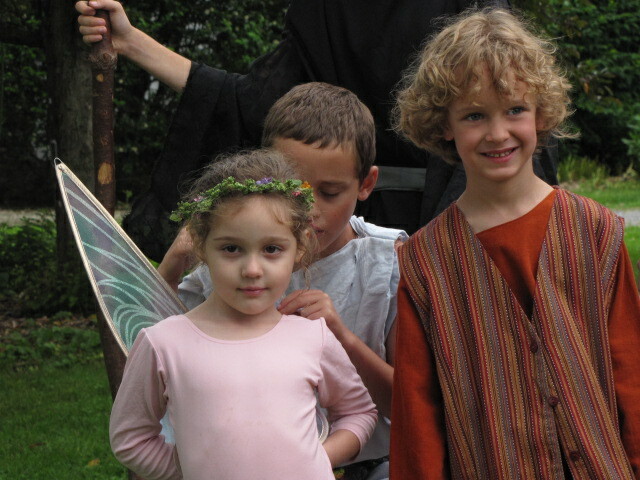 AMSND is a wonderful choice if you have a large amount of kids participating because young ones can always be fairies or in the case of boys woodland creatures (think little Peter Pan type costumes). The dialog is beautiful, poetic and easily memorized and quite a bit of the play is funny. AMSND (2011) My little fairy gets fed her lines by her big brother. 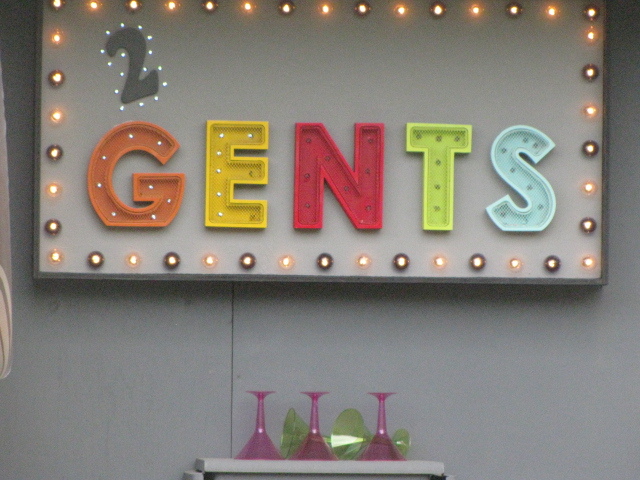 This was our second or third performance of this play, we love it so. 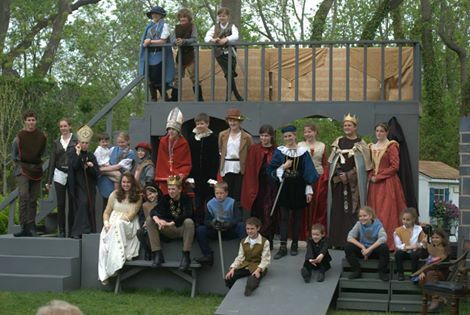 We had such fun that first year, the backyard of the cottage was our set and out costumes were handmade from bits and pieces we cobbled together. As the troupe became a little smaller, some families left for a variety of reasons, the focus became a little tighter. The plays were a little more intense and the costumes got better, still handmade but we were stretching our skills. We were blessed to have a young lady who is an actual seamstress be part of the production for her high school years and she was a genius at turning thrift store finds into Renaissance era clothing. All the moms spent quite a bit of time with our sewing machines that year as well. 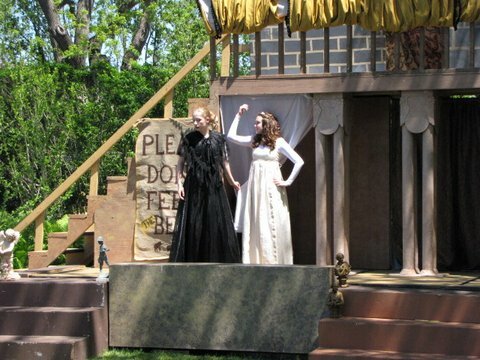 After we built up a good stash of Shakespearean fashion, (housed in my friend Mary’s husband’s trailer that he used to use for work but we stole it), we focused on sets. Now you should know that when I say “we” I had nothing to do with this. Mary’s husband (a good guy to be sure) built us, at first, a kind of background that was moveable and painted to look like a castle interior. Hung with some “tapestries” created largely from thrift store curtains or painted drop cloths, these were effective and helped elevate the performance. We still use these today. Since we are homeschool moms, we are always thinking of how to make things better and how to make our own lives harder, we cajoled that same dad (canonized he shall be) to build us a two story set. A mere two years after creating the above backdrops. The kids, under Mary’s direction (she’s an artist by trade) painted it. The talented building dad is Mary’s husband and now runs screaming from the room whenever we approach him with a plan. The set is built on a trailer (again we stole it from him, poor man) and is move-able but this is not something we actually haul around. It does disassemble, with much trouble, and this has to be done after before and after the season because these nice people need their yard back. 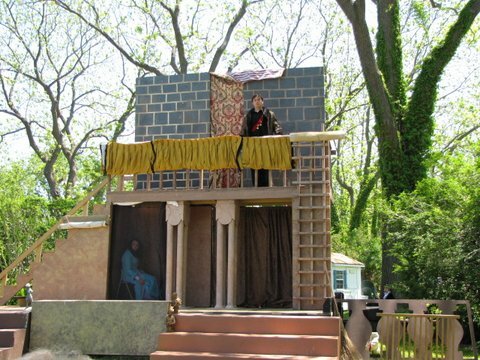 We have since moved from cottage performances to Old Field (a lovely little hamlet here on Long Island where Mary’s husband houses his business which still survives in spite of our treachery) because of the set. Henry V (2016) my favorite play. If we can do this so can you. Maybe not a two story set, at least not right away, but you can certainly get a small group of children together to perform. 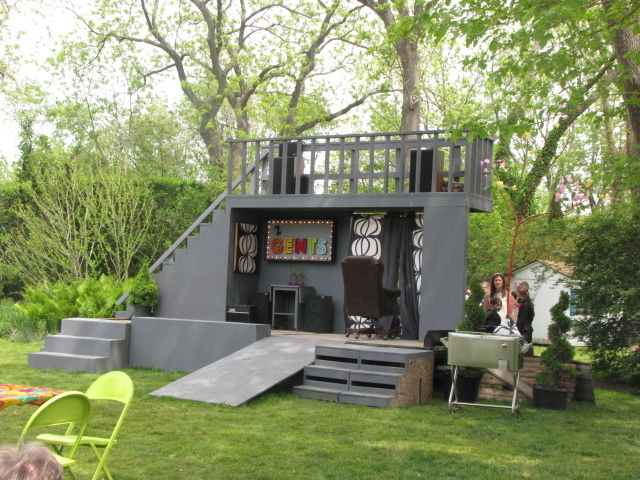 Performing Shakespeare is essential to a well educated person (in my, not so, humble opinion). Not only does the student become intimately familiar with the plays and the language, they become comfortable with speaking eloquently in front of people, it trains their ear for the beautiful rather than the vernacular (which nowadays is like, you know, pretty awful, ya know, tru-dat). Why Should I Learn This; A Guide For Homeschool Parents and Students . Edited by Erin Conroy Brown. Every effort I have put into Shakespeare season has been worth it. Now if you ask me two days before the first performance I will grab you by the shoulders, shake you and ask you to deliver me from this madness, but I don’t really mean it. I think all of us moms (eight in all) would tell you that this has been and continues to be one of the best experiences of our homeschool lives. 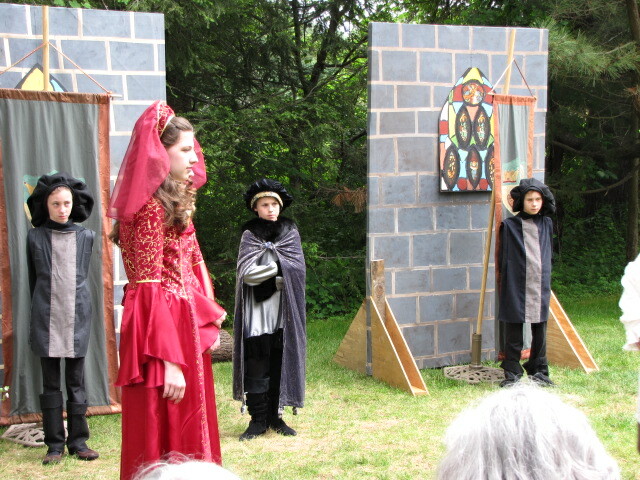 The children take great joy in learning Shakespeare and performing. They have great ideas now, having grown up doing this, about costumes, props, blocking and expression. They have forged life long friendships through this group and this blesses our lives in countless ways. Do we just perform it? No of course not. We read it, we attend live performances, we memorize poetry and soliloquies, we watch good movies (Kenneth Branagh, Mel Gibson, Laurence Olivier) and we quote him all the time. It’s a little annoying to people actually. This book includes selections from many plays as well as sonnets. It’s illustrated beautifully by Glenn Harrington and is useful for memorization, dictation and copywork. Yes you can get any of these selections anywhere but the beauty of the illustrations makes this book really worth having in your collection. Arthur Rackham’s illustrations are exquisite and help a young child visualize the magic of this play. This series, by Lois Burdett, is not my favorite Shakespeare resource but the kids liked it. I do like the telling of Shakespeare’s life in this particular book. It’s illustrated in child’s portraits and drawings (her students) and told in rhyme which the children seem to really enjoy. This book is a great resource for your visual learner. The pictures are great, there is a timeline in the back and there are tons of interesting facts and tidbits included/ The pigs bladder filled with sheeps blood sidebar always gets a lot of attention from the boys and the costume pages seem to draw the girls. It’s also a great resource when studying about the Globe Theatre and I’ve assigned much copywork from those pages. Colville’s picture books retelling some of Shakespeare’s plays are truly worth having. I’ve been collecting them for years and the older children will still pull them out on occasion. The illustrations are stunning and the re-tellings worthy of the bard. This classic retelling of Shakespeare’s tales is from the author of The Railway Children and many other popular children’s stories and series. It’s a classic that every homeschool should have on it’s shelves. Another classic that retells the tales beautifully. The language is a little less modern than that of Nesbit but that only enhances the retelling for me. You can get illustrated versions as well. No Fear Shakespeare (the link leads to Hamlet). I don’t buy these but we do borrow them from the library. They are published by SparkNotes and have the modern language version of Shakespeare’s words on the facing page. If I have someone who is having trouble understanding the context of a scene or really struggling with the language we take a look at these books and very often all becomes clear. A good weapon in the arsenal. Most semesters Homeschool Connections offers live online classes in Shakeapeare and very often they are taught by renowned Catholic scholar Joseph Pearce. This year my high school student took King Lear from him and absolutely loved it, so check out their course offerings. Note: The Amazon links are affiliate links, so I get a half penny or something if you order the books. Homeschool Connections is not an affiliate link, I just love the service and have had great experiences with them. 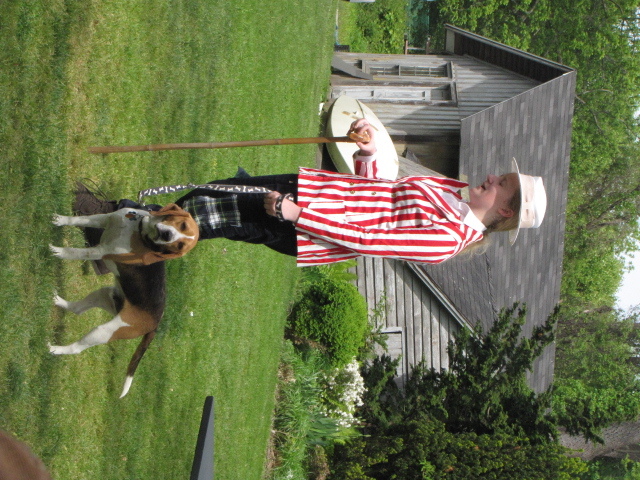 As you can see, we take the Bard and his work very seriously here. Stay tuned for pictures of Love’s Labor Lost, which I will probably get to posting sometime in June.